Ottawa criminal lawyer Michael Spratt says the province is getting a "kickback" from commissions it receives on collect calls made from provincial jails. Inmates can only make collect calls, and nearly 300,000 phone calls are made each month. 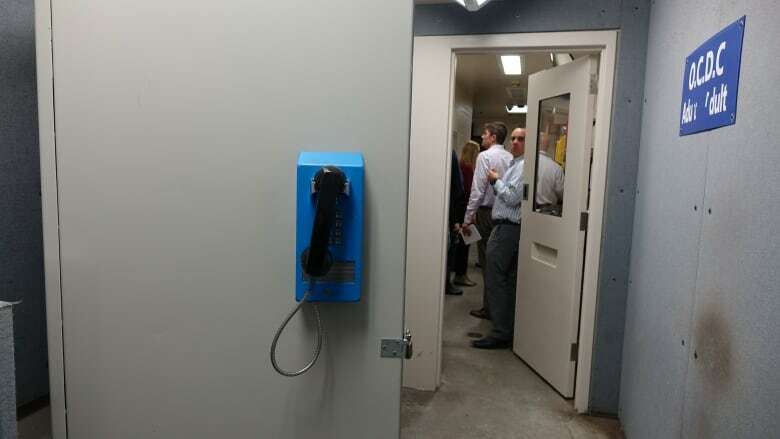 A wall-mounted phone by the steel doors of a jail cellblock is a precious lifeline to the outside for inmates, but in Ontario, calling their loved ones comes at a price. Inmates can only dial out by placing collect calls. There are no free calls, even if they are local. Ottawa criminal lawyer Michael Spratt has obtained documents that show the government gets a commission from every collect call made from provincial jails. "This is a kickback," he told CBC News. "What I find unconscionable is that the government and corporations are making money off the backs of people who are presumed innocent and in custody." Through a provincial freedom of information request, Spratt obtained contracts related to Ontario's "offender telephone management system" and shared them with CBC News. The documents detail an agreement between Bell Canada and the Ministry of Community Safety and Correctional Services starting in 2013. The contract shows Bell has agreed to pay the Ontario government a commission based on a percentage of all gross monthly revenue generated by the telephone management system. The value of the contract isn't disclosed, but the deal states: "There shall be no charges payable by the ministry under the contract to the supplier unless otherwise agreed upon by the parties in writing." The documents include about 1½ pages of redactions, with the exact percentage of the monthly commission Bell is to pay the province scrubbed from public view. The phone rate Bell charges is also hidden. But the contract does stipulate that Bell will charge the same rates and connection fees it provides to its residential customers. "The redactions are telling," said Spratt, who is concerned about the lack of transparency. "What we often say in law is that it looks like a consciousness of guilt when you hide something … I wonder if the government feels a bit guilty about this revenue system." Ontario's Minister of Community Safety and Correctional Services Marie-France Lalonde wasn't available for an interview Friday. In a statement, Lalonde said the current contract expires next year and they'll "take these issues into consideration" when talking about its renewal. She added the department is looking at ways to make it more "cost-effective" for inmates to communicate, especially when they're far from their support network, and one solution could be to introduce pre-paid calling cards for collect calls. In an earlier email, ministry spokesperson Brent Ross wrote that commissions have been collected since 1997. Inmates in Ontario's 26 provincial jails make an average of 239,000 local calls and 50,000 long distance calls while incarcerated each month. Ross said the commission collected goes into the province's general revenue and is "used to offset tax-based expenditures." The ministry refused to answer CBC's question about how much money it has made from collect calls from jail, but the phone bills sent to Spratt's law firm paint a revealing picture. Spratt said Bell sends his firm a bill each month ranging from $1,000 to $5,000. The tally of collect calls runs across 30 pages. His clients are usually calling from the Ottawa-Carleton Detention Centre, but because of overcrowding many inmates are transferred and call long distance from out-of-town jails. His firm is charged $1 per local call, but a 20-minute long distance call costs $25. Most of the time the inmates call to speak to their lawyer, but sometimes clients will call Spratt's firm so they can be forwarded to the cell phones of family members. The phones from jail can only make collect calls to landlines, and Spratt said many families can't afford the added cost. That hardship is part of the reason why Spratt is considering using this access to information request as a basis for a future constitutional challenge. "This was the first step in what I feel could be a constitutional challenge to punitive and unfair rates that disproportionately impact poor and vulnerable people in jail," Spratt said. In an emailed statement, a Bell spokesperson wrote that Bell does not discuss details of any business or government contracts.